Their work, he said, "relates to the prosecution." He added: "It may impact the prosecution, but it has not, and whether it will is a matter of speculation. So far as to how it relates to the prosecution, that is protected by both attorney/client and work product privileges. Mr. Zarrab has not waived either of those privileges and will not." Zarrab is awaiting trial after his March 2016 arrest. He has pleaded not guilty. Brafman informed U.S. District Judge Richard M. Berman by letter of the role the lawyers are playing in the case. The judge sought the clarification this week after prosecutors asked him to ensure there are no conflicts of interest. Prosecutors said in a letter to the judge days ago that law firms employing Giuliani and Mukasey have represented bank victims in the case. 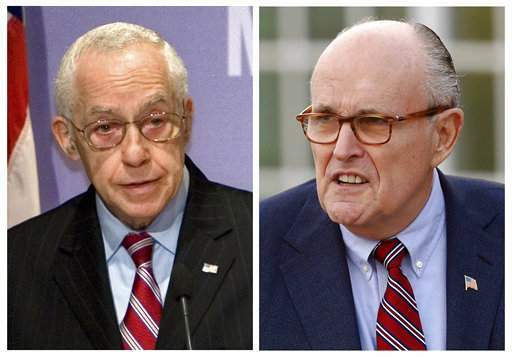 They also said Giuliani and Mukasey are involved in efforts to resolve the charges. The New York Times reported Monday that Giuliani and Mukasey traveled to meet Turkey's president, Recep Tayyip Erdogan, as part of their efforts on Zarrab's behalf. Giuliani was one of Donald Trump's most prominent advocates during his successful Republican presidential campaign last year. Giuliani spoke at many of his rallies and promoted him on various media shows. Mukasey's son, Marc Mukasey, has been mentioned as a candidate for U.S. attorney in Manhattan.